In a mixing bowl, combine flour, baking soda, spices and salt. Mix together until combined. Set aside. In a separate bowl, cream together butter and sugar (white and brown) with an electric mixer. Mix until light and fluffy. Beat in the egg and vanilla until well incorporated. Beat in pumpkin puree. Slowly add in dry ingredients (I did this with a wooden spoon) until just incorporated. 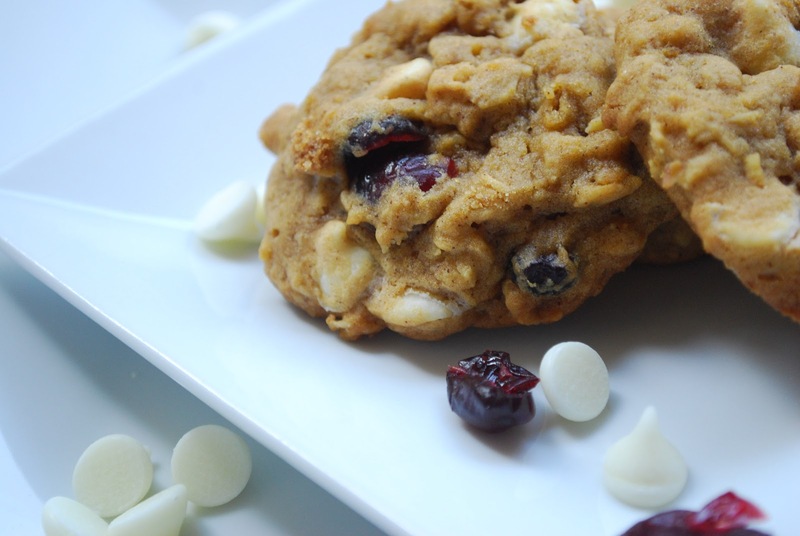 Mix in oats, white chocolate chips and oats by hand. Using a small dough scoop (or a spoon) drop dough onto baking sheet, spaced 2 inches apart. Bake for approximately 14 minutes. Allow cookies to cool slightly on the baking sheet before transferring them to a cooling rack. Let cool completely before storing.